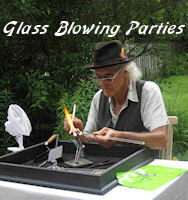 Why not hire a glass blower for your next corporate party, birthday party, bar mitzvah, company picnic, store promotional events and more. John the glass animal sculptor will add rare spice to your party festivities by making beautiful miniature glass animals on the spot on request, excellent party favours to take home. Glass Animals created in front of your eyes! With decades of experience and a minimum of portable equipment John has performed his magic to delighted party goers at corporate events, Bar Mitzvahs, birthday parties, weddings and college functions. Educated at the Ontario College of Art John has been a professional artist creating glass in the classic tradition since 1980. He has made and sold well over 100,000 pieces and counting. Over the years they have been on sale in gift shops, museums, and craft shows from the Florida keys to Yellowknife in northern Canada. They have appeared in Readers Digest trade mag, two Canadian films, and as props in many productions of "The Glass Menagerie", across North America. Three hours of Glass Blowing Party Entertainment includes up to 18 medium size glass animals or 24 small size glass animals. Made at the party and wrapped in a party bag to take home. If your having a Birthday Party you won't have to worry about loot bags, your little party guests can take one of these masterpieces home with them. Extra premade pieces at additional cost. Demonstration and glass animals made by request on the spot.